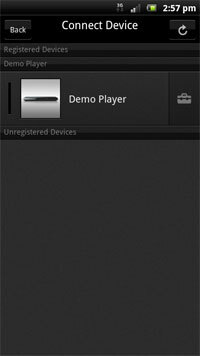 Registering the Media Remote (BD Remote) for Android with the Blu-ray Disc Player. 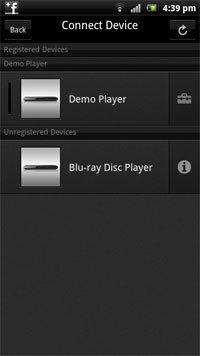 Connect your Blu-ray Disc Player to the Network (to your wireless router, etc. Please refer to your device or your router's operating instructions). Press Home on Blu-ray Disc Player Remote to open the XMB menu. Select Setup → Network Settings → BD Remote Device Registration. Select Setup → Network Settings → Media Remote Device Registration. Connect your Android device to the same Network your Blu-ray Disc Player is connected to. Start Media Remote for Android app on your Android device. 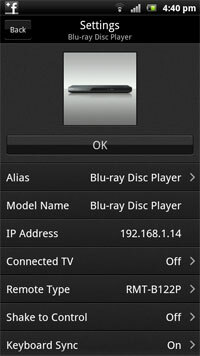 If the Blu-ray Disc Player and Android device are connected to the same network, the Blu-ray Disc Player will be listed on this screen. Tap the Blu-ray Disc Player name to show the Registration button as shown below. 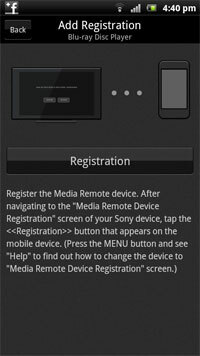 Select Start Registration on Blu-ray Disc Player, then tap the Registration button on Media Remote app. After the devices are connected, select OK on Media Remote app and Finish on Blu-ray Disc Player. Now you can use Media Remote app on your Android device to control your Blu-ray Disc Player.